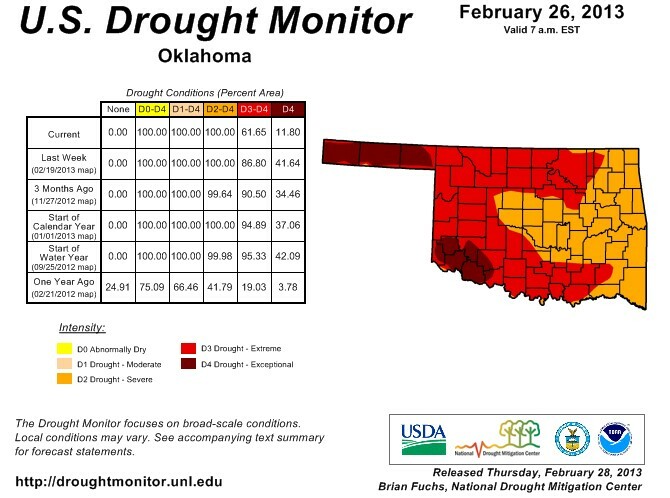 Oklahoma saw dramatic improvement in the drought conditions as reported on Thursday, as the latest US Drought Monitor was released. The month began with 92 percent of the state depicted in at least extreme drought by the U.S. Drought Monitor, and 40 percent considered to be in exceptional drought. The Drought Monitor’s intensity scale slides from moderate-severe-extreme-exceptional, with exceptional being the worst category. The latest report released on Feb. 28 and seen in the graphic above portrays remarkable improvement with only 12 percent of the state in exceptional drought. The amount in at least extreme drought dropped to 62 percent. The state had not seen a lower percentage of exceptional drought since the end of last July when the level was at five percent. Only the Panhandle and far southwestern Oklahoma remain in exceptional drought. Most of eastern Oklahoma dropped from extreme to severe drought thanks to improving drought impacts. Soil moisture data from the Oklahoma Mesonet show saturated soils down to 24 inches across the eastern half of the state, with similar conditions in the topsoils across all of Oklahoma. To offer a visual in how different things are this week versus just a week agao- the map below is of the Drought Monitor for Oklahoma from last week. Click here for the National Drought Monitor website to learn more.